The Ebac CD60 Dehumidifier is a powerful industrial dehumidifier which can extract 56 pints of water per day from the air at 80° and 60% relative humidity. This unit can dehumidify an area of up to 1500 sq ft (manufacturer's recommendation) and can do so effectively in very low temperatures. It is built to withstand the worst of operating conditions and is suitable for either stand alone operation or a permanently ducted installation. The Ebac CD60 Dehumidifier is another rugged and durable machine from Ebac designed not only to perform in harsh environments but to do so dependably. It has been used successfully in a variety of demanding locations including warehouses, storerooms, electrical & communications switching stations, locker rooms, basements, pumping stations, offshore oil rigs and active and laid up marine vessels. It is manufactured using high quality components and mounted in a strong steel cabinet further protected by an epoxy coating. A "floating" compressor is installed which reduces the risk of internal damage to the unit while in transit or as a result of vibration from its working location. The CD60 Dehumidifier is a versatile unit which is suitable for permanent installation at any location or transported from site to site as needed. At 82lb it is perfectly practical to transport between locations and with its compact dimensions of 17 x 14 x 20 inches it will fit easily into almost any vehicle and can be installed where space is tight. Where a permanent installation is required this unit can be ducted in order to work effectively across areas which are subdivided by walls or partitions. The Ebac CD60 is well prepared for operation in locations with low ambient temperature as it is fitted with Ebac's highly effective hot gas defrost system. The effects of ice formation on the refrigeration coils of a dehumidifier will be well known to most of you. 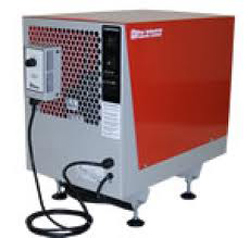 Without hot gas defrost a dehumidifier would be unable to operate effectively in the low ambient temperatures found in many industrial and commercial locations but this feature allows the CD60 to operate at temperatures as low as 33°F. The Ebac CD60 also incorporates an adjustable humidistat which is essential if the dehumidifier is in a permanent installation, particularly at a remote location without constant supervision. This device allows the desired level of relative humidity to be set and maintained. The unit will only operate when the relative humidity rises above the pre-set threshold and this saves on the cost of energy. It may also be of critical importance in locations where large fluctuations in relative humidity are as damaging as a level that is simply too high. The CD60 is also equipped for continuous drainage, equally essential when the machine is unattended. This unit incorporates an internal condensate pump allowing the condensate to be discharged at a level higher than the dehumidifier which can be a considerable advantage in some locations. For a unit of its capacity the Ebac CD60 Dehumidifier is relatively quiet in operation with a noise output of 57dB. This no greater than some room dehumidifiers and should not be intrusive for employees, visitors or customers present at its location. The unit's capacity for ducted installation will also make it possible ion many sites to locate the unit out of sight and largely out of earshot. Naturally a dehumidifier of this quality does not come cheap and a buyer may pay around 1400 to 1500 dollars for the CD60. The capabilities, high build quality and durability of this unit may, of course, be set against this cost.